Cycad Cones in Joe's Cycad Gardens.Encephalartos manikensis, male cone. Origin and Habitat: Encephalartos manikensis occurs in Zimbabwe and Mozambique. Most of the plants are found in the highlands of the Mapande Range. In the south from Mount Selinda in Zimbabwe northwards through the Chipinge area, near Mount Nyanyadzi, along the Odzi and Garezi rivers and on to Mount Gorongo and further north to Mount Darwin (Pfura/Fura). The type locality is the Numkwarara (Nyamkwarara) Valley near Mount Gorongo. In Mozambique plants are found near Garuso, Mount Bandula, Mount Chicamba, near Vanduzi and Mount Chinhazanza (Chinyayadze/Chinyazange) near the Pungwe (Pungoe/Pungue) river. The population size is estimated to be less than 10,000 mature individuals. Some subpopulations are still quite large, especially in Mozambique. Altitude range: Recorded from 600 to 1,400 metres above sea level. Habitat and Ecology: This species is usually found on grassy slopes on granite hills, usually in full sun, amongst large rocks in exposed open conditions and also in river valleys in places associated with forests. E. manikensis is primarily threatened by the poaching of wild plants for ornamental purposes, but also by afforestation and agriculture. Description: Encephalartos manikensis is is a stout evergreen cycad that develops into a medium plant producing initially a single, erect trunk growing up to1.5 metres tall. It has a standard look of a big cycad and the leaves can be up to 2 metres in length, emerge light green and become mid green. 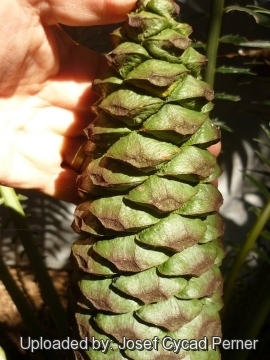 The size of the female cones can vary greatly and occasionally very large cones, almost 1 m in length, are produced. Male cones in this species are so big they can't easily be told from female cones. Derivation of specific name: 'manikensis' named after the Manica districts of eastern Zimbabwe and western Mozambique where this species occurs. 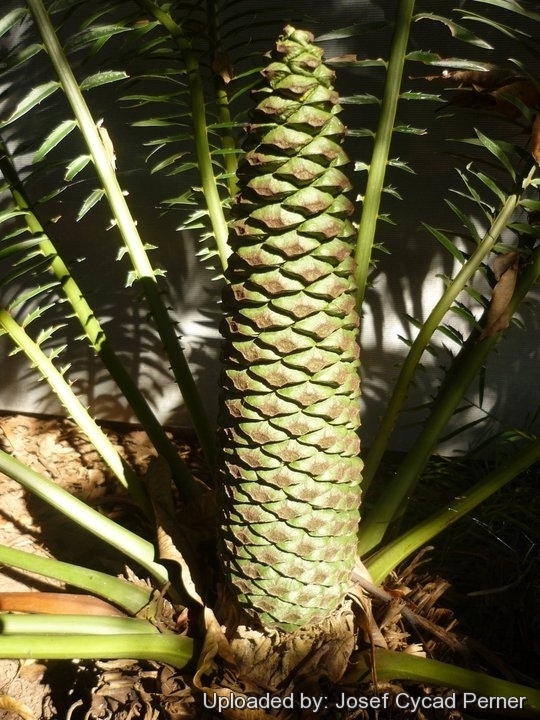 Stems: It is a medium size cycad with a trunk rarely exceeding 1.5 m in height or 30 cm in diameter. It suckers freely from its base and forms clumps. Leaves (fronds): 100-200 cm long, 35 cm wide, narrowly ovate-lanceolate to oblong in outline, straight, with c. 60 pairs of pinnae.Petiole 5–10 cm long. Largest pinnae 12-15 × 2-2.5 cm (sometimes up to 19 x 3.5 cm), lanceolate-ovate or narrowly elliptic, ending in a forward directed spine and 1 or 2(-4) spines on on each side the upper margins and towards the base or rarely entire. Leaflets reduced to short simple spines towards the leaf-base. Cones: Both the male and female cones are green, becoming slightly yellow on maturity. Plants produce up to 3 female cones cones, almost 1 m in length and can produce 1-4 male cones together, but occasionally as many as 12. Male cones: 25-60 cm tall on a peduncle of 5-15 cm. Median male cone-scales slightly spaced when mature, at right angles to the axis, with their heads slightly deflexed; heads bluntly triangular in outline with curving acute-angled margins, terminal facet concave. Female cones: c. 30-45 × 20-25 cm (occasionally as long as 1 metre), loosely woolly; median scales at right angles to axis, c. 5 cm. long with slightly deflexed heads, glabrous; heads dorsiventrally flattened and blunt, deltoid in outline with curving acute-angled margins, terminal facet concave. Seeds: About 2.5-3.5 cm long, broadly ellipsoid, scarlet, darkening with age. 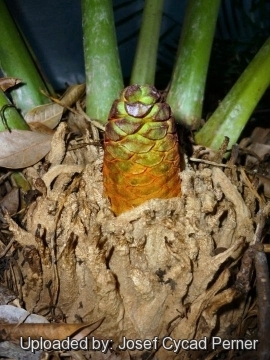 Taxonomy notes: Encephalartos manikensis is allied to Encephalartos gratus, but it is easily distinguishable principally by the lack of puberulence on the mature cone-scales. There is considerable variation between populations from different sites and this has raised questions about the taxonomy of these populations, and some botanists argue that there could be as many as five specie. Moreover this cycad has many mistakable, related species. Encephalartos chimanimaniensis R.A.Dyer & I.Verd. : Pollen cones 1-4, fusiform, green, 50-70 cm long, 8-10 cm in diameter with curving scales. Distribution: Chimanimani Mountains, eastern Zimbabwe. Encephalartos concinnus R.A.Dyer & I.Verd. : Pollen cones 1-4, fusiform, green, 30-50 cm long, 7-10 cm in diameter (smaller than E. manikensis). Distribution: Southern Zimbabwe. Encephalartos manikensis (Gilliland) Gilliland: has pollen cones similar to seed cones, with scales that are thicker than those of E. concinnus, lack the curving seen in E. chimanimaniensis and lack the wings of E. pterogonus. Encephalartos munchii R.A.Dyer & I.Verd. : has 1-6 bluish-green pollen cones, narrowly ovoid, 40-65 cm long, 7-9 cm in diameter and bluish-green leaves and leaflets with 3-6 spines on each margin. Distribution: Mozambique. 1) Donaldson, J.S. 2010. Encephalartos manikensis. The IUCN Red List of Threatened Species. Version 2015.2. <www.iucnredlist.org>. Downloaded on 25 August 2015. 4) Haynes J.L, World List of Cycads: A Historical Review, IUCN/SSC Cycad Specialist Group, 2011. 7) Dyer, R.A. & Verdoorn, I.C. “Encephalartos manikensis and its near allies” Kirkia 7(1) Pages 150 - 151. (Includes a picture).1969. 8) Golding, J.S. (ed.) “Southern African Plant Red Data Lists.” Southern African Botanical Diversity Network Report No. 14. SABONET. Pretoria. Page 55. 2002. 9) Goode, D. “Cycads of Africa” Struik, Cape Town Pages 166 - 171. (Includes a picture). Cultivation and Propagation: As a garden subject, Encephalartos manikensis is one of the most spectacular of all cycad species is the cycad most commonly grown in Zimbabwe and can be seen in many gardens and in the main street of Harare the capital and most populous city of Zimbabwe. Tends to sucker well and is very adaptable in cultivation. The seedlings grow rapidly, developing into an attractive garden plant with 1 m long leaves in four to five years. This is one of the fastest growing cycads and responds well to cultivation provided it has a well-drained soil, frost-free conditions and regular watering during the dry months. It is an adaptable plant well suited to subtropical climates. It can be grown in full sun without its leaves burning. When young they can be grown as a container plant and eventually transplanted into the garden. As a garden plant, this cycad will usually hold two or three crowns of leaves, all in good condition. Growing rate: In cultivation this cycad is very easy to grow and grows quickly, it will reach coning size in 8 - 10 years. Needs a large garden due to its size. It likes water and regular feeding and if it finds the right spot in the garden, will grow remarkably well. Seedlings can be a little slow to get started for the first couple of years if they are grown in containers which do not allow room for the tap root to develop. Soils: It grows in all sorts of soil type, but prefer well drained, gritty soil with plenty of water, especially in dry weather. Exposure: It thrives and grows best in full sun or partial shade. When grown in full sun, the leaves are a little shorter and less likely to be damaged by wind. The leaves of those plants grown in the shade can become stretched out and damage the caudex if they break off close to their base. Hardiness: Frost sensitive (USDA zones 10-12) . Encephalartos manikensis is well represented in botanical gardens and private collections worldwide where the tropical cycads can be grown. However it exhibits an unusual amount of cold tolerance by surviving in temperate areas as well. In the warmer portions of southern California it grows with apparent ease, only suffering defoliation or leaf burn during extreme winters. Propagation: It may be propagated by seeds. They are among the easiest plants to germinate, but appears to need shade for successful germination.